You just applied the last strokes of paint to the canvas. A certain feeling of triumph rushes over you. You are so proud to add this piece to your collection. All painters feel similar towards their creations. Each painting portrays a part of the artist themselves and essentially is priceless. When something has this much value it is wise to have some sort of back up. Of course it would be impossibly boring to paint a duplicate. 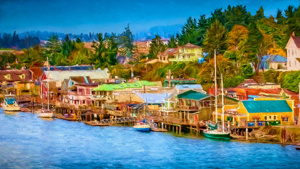 The best way to go is to create a digital image of your painting. With this image, you forever have it digitally stored which has many uses including the ability to print reproductions. But how do you go about turning your painting into a high resolution digital image file? You may not be a photographer but you surely have the capability of photographing your art with a little direction and advice. What you Need: It is essential to have the equipment below when photographing art. Easel: Use for holding artwork upright and square to the camera. Electronic cable release: Use with the camera when shooting artwork. This cable releases the shutter without shake or vibration from triggering the camera by your finger. Tripod: Use a tripod to make things level and square in the view finder and to eliminate shake or vibration. 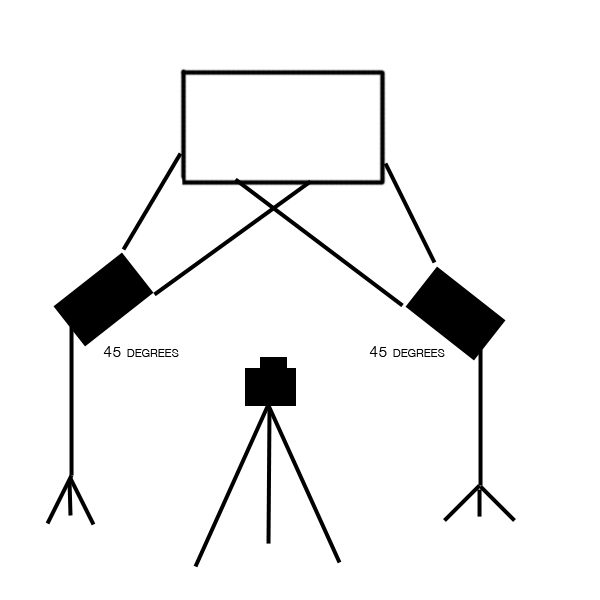 Light Kits: Use a lighting kit which consists of light stands, strobe heads and soft boxes or umbrellas. You can purchase this kit for under $600.00. Additionally you can use continuous light from assorted brands of hot lights. If you cannot set up a small studio inside your house then one option would be to shoot the artwork outside. Although it is not the optimal way of photographing your painting, art copy work can be achieved without lights in natural outside lighting in the shade where the area is evenly lit. 1. Mount your artwork onto the easel using a level to be sure it is upright and square to the camera lens. 2. Mount your camera to the tripod. Make sure the angel of camera is perpendicular to the painting to negate distortion. If the camera is angled up or down even slightly, this will cause the image to look warped. 3. Frame and position with the tripod to fill the view finder with the painting. When you look in the view finder, be sure the subject fits perfectly meaning the painting will be square and even on all four sides. 4. Photograph the artwork with the grey scale in the frame of your shot. 5. If using lights, position them at 45 degree angles bouncing the light equally into the umbrellas or soft boxes and back onto your art. Lighting is key. Remember what you see is what you get so before making your exposures, be sure lighting is even by using a light meter or by measuring the distance of the lights from the subject you are photographing. 6. 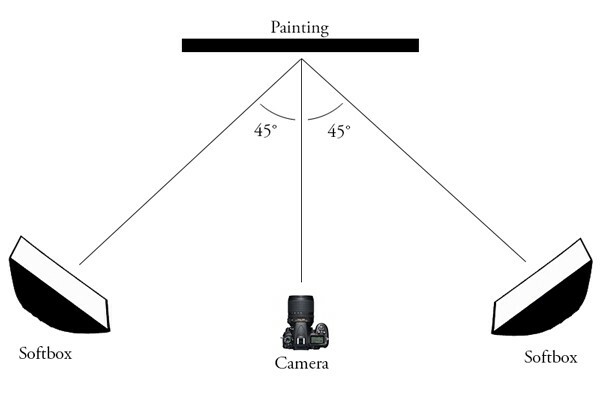 If shooting outside without lights, make sure the light on your painting is even distributed. The surface of the painting may have a reflective quality so beware of light kicks and shine. This would blow out your highlights, thus leaving no detail for printing. 7. 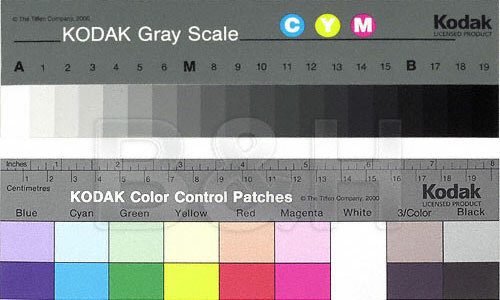 With your camera’s built in light meter, you can achieve your desired exposures. With strobe lighting you will need a light meter to determine your exposures. 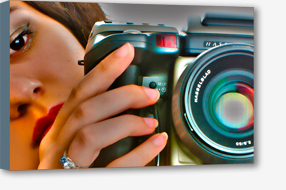 If you do not wish to photograph artwork yourself you can send your art to us! Cave Art Printing is a professional printing studio that provides art copy work service. Once you get a digital file of your art the next step is to decide what you want to put it on. Here at Cave Art we create Giclee (pronounced: Gee-Clay) prints on canvas that are difficult to distinguish from the original. The fine art papers we use are industry leaders for their beauty and archival quality. Check out some of the options here or give us call.